SUBHEAD: Our congresswoman Tulsi Gabbarb seeking information from Navy on their methods of protecting Hawaii's environment. 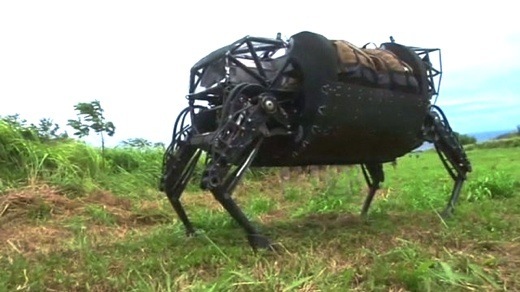 Image above: Marines test military robot in Hawaii during RIMPAC 2014. From (http://www.bbc.com/news/technology-28290945). Hawaii Congresswoman Tulsi Gabbard is requesting information from the U.S. Pacific Fleet in Pearl Harbor about the Navy’s efforts to monitor the effects of the Rim of the Pacific military exercise and Kauai’s Pacific Missile Range Facility on the ocean and marine ecosystems. “Several constituents have raised concerns about RIMPAC, as well as the exercises conducted at PMRF, causing serious damage to marine life, including injuring sea turtles, cetaceans and corals,” Gabbard wrote in an Oct. 2 letter to USPF Commander Adm. Harry B. Harris Jr.
Held every two years and hosted by the U.S. Pacific Fleet, Rim of the Pacific, or RIMPAC, is the world’s largest international maritime war exercise. In total, 22 nations, 49 surface ships, six submarines, more than 200 aircraft and 25,000 personnel participated in this year’s event, which lasted from June 26 to August 1 and included live fire target practice and the sinking of the decommissioned USS Tuscaloosa 57 nautical miles northwest of Kauai. The drills take place in the Hawaii Operating Area and several off-shore ranges, including Kauai’s Pacific Missile Range Facility. About 500 PMRF employees were actively engaged in supporting this summer’s event. In her letter, Gabbard inquires about specific actions the Navy took during RIMPAC 2014 to prevent adverse impact to the marine environment, including sea life. “Additionally, has the Navy, or any other entity, conducted other research to show that RIMPAC and other training exercises are not adversely impacting the environment?” she asked Adm. Harris. If not, Gabbard requested the Navy examine such a course of action. “As the Navy conducts training and testing in the ocean, we all must keep in mind that the ocean is an integral part of Hawaii, our economy, and our culture, and we all must continue the work to ensure that our ecosystems are not irreversibly damaged,” she wrote. As of Tuesday, Harris had not yet responded to Gabbard’s request for information, according to PMRF spokesman Stefan Alford,who said he would provide a copy once one has been sent. Every two years, the month-long RIMPAC exercise brings with it concerns from individuals and environmental groups who say it negatively impacts marine life, including endangered species. One of those citizens on Kauai is Hanalei resident Terry Lilley, who has copied Gabbard on dozens of emails and photos over the last year documenting what he says shows the serious damage being caused to Kauai’s nearshore marine environment, including turtles and corals, by the Navy’s activities. Lilley applauded Gabbard and said he doubts she would put her neck out on the line the way she did without serious concerns of her own. Attempts to reach Gabbard’s press secretary Tuesday were not successful. In late July, a 16-foot sub adult pilot whale washed ashore and died in Hanalei Bay. While some suspected the death may have been a result of naval activities, a Navy spokesman said at the time there was nothing to indicate that and it would be premature to speculate. A team of scientists conducted a necropsy on the whale on July 26, but the examination did not produce results indicative of a cause of death. Tissue analysis intended to help determine the cause of death have been started and will take several weeks to months to produce, the National Oceanic and Atmospheric Administration said in a release. PMRF Commander Capt. Bruce Hay previously said he was pleased with the cooperative efforts during RIMPAC in the successful use of protective protocols for marine life.